Is there anything more frustrating than a backed-up shower drain? Not only are clogged drains incredibly inconvenient (it’s no fun taking a shower when you’re standing ankle deep in dirty water), they can also be incredibly difficult to deal with once the water starts backing up. 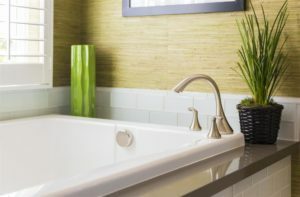 If you don’t want to find yourself dealing with a clogged bathtub drain, take a look at these drain cleaning tips. Noticed the bath water isn’t draining as fast as it used to? One thing you can try to get things running smoothly again is sticking a bent wire hanger down the drain and using it to break up and dislodge any clogs. Just take a standard wire hanger and bend it into a straight line so that it can be stuck down the drain while, also, making the end into a little hook for extra clog-busting power. Sometimes clearing a drain is as easy as pouring water. Literally. Fill a large kettle or a pot with water, and then heat until boiling. Once the water gets hot enough, pour it down the drain in three phases. Pour one third of the water into the drain, then wait a few seconds for it to drain a bit, then repeat two more times. 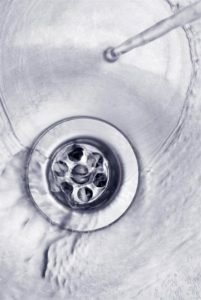 Many drain clogs don’t need an expensive drain cleaner like Drano or Liquid Plumber to fix them. Instead, all you need is some baking soda and white vinegar. Combine 1/3 cup vinegar with 1/3 cup baking soda and pour the mixture down the drain immediately (while it’s still fizzing). When these two substances interact, it causes the baking soda to expand and bubble, making it the perfect drain-cleaning solution. If you have a wet/dry vacuum, it can also be used to clear a drain. First, set the vacuum to vacuum liquids. Place the hose over the drain, creating as tight a seal as possible, and turn on the vacuum to maximum power. If the seal isn’t tight enough, one trick you can try is to attach an old plunger head to the vacuum hose. Sometimes it really is necessary to “throw the baby out with the bathwater.” Even the best-maintained bath and shower stalls and pipes eventually need to be replaced. If you’ve tried everything and still find that your drain is getting backed up on a constant basis, then it’s probably a sign that something needs to be replaced. The good news is that many modern bath and shower stalls are designed better than their older counterparts, including when it comes to their drains. Where an old, outdated bathtub design might not drain well, a new and better-designed shower kit may be the answer. American Bath Enterprises, Inc. carries a full selection of tub shower units, including ADA-compliant showers and baths for the disabled. To learn more, contact us today at 888-228-4925 or browse our online inventory.